It’s not every day that the postman brings a package from Buckingham Palace so there was much excitement in our household when this delightful book arrived. Over 50,000 people visit Buckingham palace as guests of Her Royal Highness Queen Elizabeth for State banquets, lunches, dinners, receptions and garden parties. This book opens the door slightly ajar to those who cater for these diners. There only thirteen recipes which are divided into Spring, Summer, Autumn and Winter because there is a commitment to seasonal produce in the royal kitchens. The recipes include Eggs Drumkilbo which was much favoured by the Queen Mother. The name comes from an ancient Highland estate in Perthshire called Drumkilbo where the dish was created. It’s a first course of hard boiled eggs, lobster and prawns. Looks incredibly decadent to me but the list of ingredients made me giggle as you’ll find ketchup and Worcestershire sauce alongside gelatin leaves and Scottish lobsters. I had a little mental image of the Queen Mum getting a bottle of Heinz out of the royal pantry. Another recipe which caught my eye was the Crown of Asparagus with Crab and Mango. I don’t know why but I thought the thoroughly modern combination of mango and crab wouldn’t feature in a book like this. It is of course in the summer chapter as the starter and boy was it fiddly to make! The asparagus is lightly cooked and then lined into metal rings to create a crown like, circular shape. The middle is filled with crabmeat, mango, chives, lemon and lime before being topped with salad leaves dressed in a lemon vinaigrette. It’s lifted carefully out of the rings and tied together with chives. Really delicious but can you imagine making this en masse? I don’t envy the commis who has to do the asparagus! The last recipe in the book is probably the one most of us will remember. 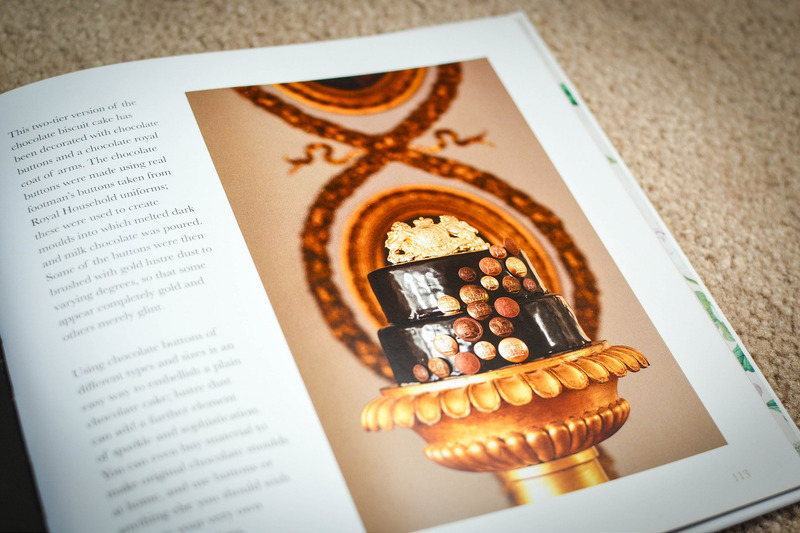 It’s the Chocolate Biscuit Cake which was one of the two wedding cakes created to celebrate the wedding of Prince William and Kate Middleton. There is absolutely no baking. The recipe uses simply McVities biscuits, butter, sugar and dark chocolate. This book is as much a history book as it is a collection of recipes that are easy to create at home. Did you know that the Great Kitchen at Windsor Castle is the oldest working kitchen in England? Modern day appliances have replaced those established to cook for Edward III in 1360 but it’s still going strong under the mediaeval oak beams and arched roof. There are extracts from recipe books and notebooks of kitchen maids. I really loved the scribbles of Mildred Dorothy Nicholls who joined as seventh kitchen maid and worked her way up to third kitchen maid before she went off to get married. Her notebook has recipes prepared for the royals but also those that were made for servants to eat as it would have been her job to prepare both. It was nice to see the Plum Pudding recipe differed only in quantities and not ingredients and judging from the measures in her notes, the servants would have been well looked fed. My favourite chapter talked about how the ingredients are sourced and the rule being to source from the royal estates but then locally where possible. The estates produce a fair amount. Sandringham is well known for its apples because the orchards were planted by King George V in the 1930s. What I didn’t know is that there are now nine varieties grown and then pressed for juice. The same estate produces blackcurrants, parsnips, wheat, rye, oats, beans, millet and barley. Windsor Home Park was established by ‘Farmer George’ (George III) but it was Prince Albert who set up the hothouses that supplied ‘exotic’ fruits such as peaches, grapes, melons, pineapples and apricots. It’s our Queen’s official birthday today and all this musing through this wonderful book makes me wonder what she’ll be having for her birthday meal. What do you think? After all that Trooping the Colour, I bet she just wants to put her feet up in the smallest, cosiest room in the palace with a cuppa and a packet of Mcvities for dunking. Bliss! Oh my! I have several American friends who would adore this book…not that I wouldn’t! This sounds a lovely book. I may have to add it to my list! That cake looks seriously impressive – can’t believe it’s a no-bake! I’ve seen so many versions of it on the web. Think the key is in the silky ganache topping. 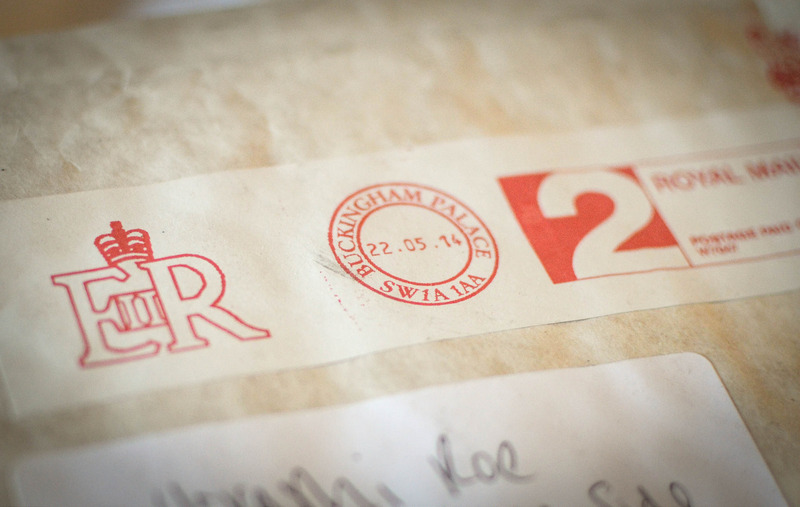 Gorgeous though isn’t bit and what a tribute to the childhood memories of our future king. How posh and delightful at the same time. I am currently drooling over that rhubarb on the front cover. I need some rhubarb in my life very soon. It’s a Pannacotta recipe i think. Must give it a try but it looked like there were lots of steps so I left it alone til I have fully put all my kitchen back together! I really must get round to planting rhubarb. It takes a full year to get crop! Wow! 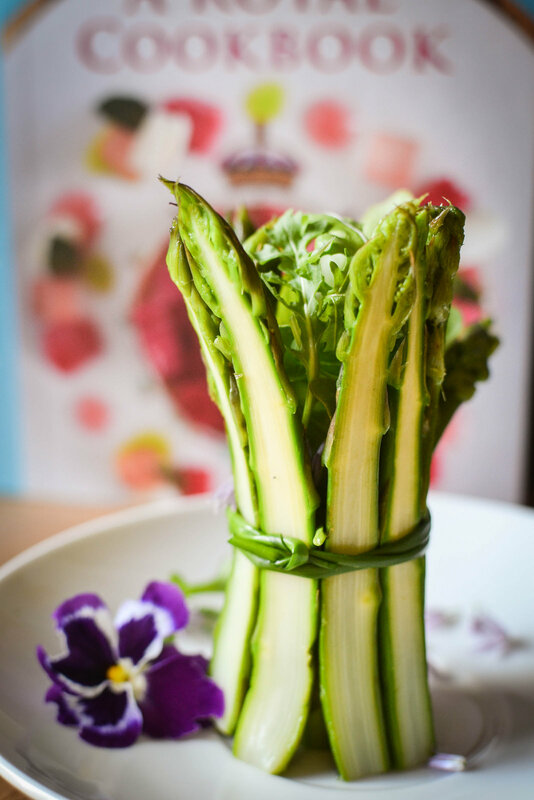 Your crown of asparagus shot is absolutely gorgeous! This sounds an interesting, behind the scenes book. I agree, American will LOVE it. I might get a copy for my Dad’s lady friend. I would live to be a fly on the wall. I imagine it to be like Downton but way more hectic! Hopefully not as many accidents/deaths! Yep I reckon the Queen dunks! Fascinating review. I think she’d be partial to a sherry too. Also works with rich tea biscuits. What a lovely treat, it looks like a fascinating read, I may buy my son a copy, he may cook for royalty sometime in the future. Ooooh really! That would be an amazing achievement for a young chef! Wow! Lovely review and I do like the image of the Queen putting her feet up with a packet of McVities after all that lobster. Thanks Andrea. I really hope she does. Love to think of her with a sense of normal. 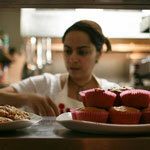 Some lovely pictures here – I do like the rhubarb pannacotta thing as well. Look forward to seeing your version soon!! Thank you Nazima. I’ve just checked the book again. It’s a parfait in a white chocolate ring! 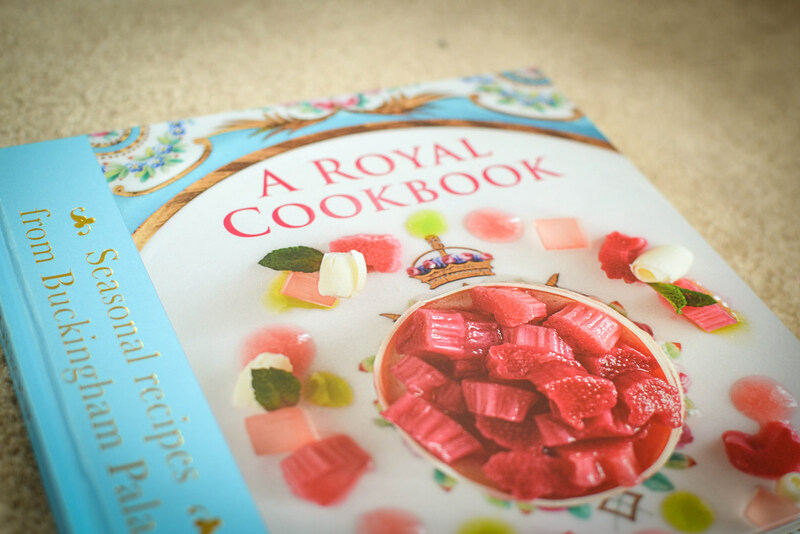 oh my god… I am SO getting this book for my mum… she is the biggest royalist she will go nuts for these recipes!!!! I love you asparagus shot here and also find it amazing that the Royal wedding cake was basically choccy fridge cake!